Primary cutaneous melanomas of the eyelid skin are rare. Approximately 5%–10% of all skin cancers occur in the eyelid. The incidence is approximately 15 cases/1,00,000 individuals per year. Basal cell carcinoma is by far the most common malignancy in the periocular area; other malignancies that occur in this area include in decreasing order of frequency, squamous cell carcinoma, sebaceous carcinoma, melanoma, and Merkel cell carcinoma. Malignant neoplasms represent the leading cause of excision and the main reason for eyelid reconstruction in oculoplastic surgery. Reconstructing an eyelid after excision of a lesion can be challenging. Defects from small lesions may be amenable to direct closure, but larger lesions often require flaps, free tissue grafts, or both. Repair of upper lid (UL) defects is more challenging because of the dynamic movement of the lid and the lid's function in protecting the cornea. In this case, single-stage UL reconstruction after the excision of malignant melanoma in a 52-year-old woman is reported. A 52-year-old woman presented to the Department of Ophthalmology with a blackish swelling of left UL (LUL) of 2 weeks duration. She also gave a history of rapid increase in the swelling. On examination, an irregular pigmented lesion, ~15 mm × 10 mm, was seen involving the middle third of LUL margin and palpebral conjunctiva. Erythema LUL and mucoid discharge were noted [Figure 1]a and [Figure 1]b. The bulbar conjunctiva was not involved and the eyeball was normal. Visual acuity was 6/6 Snellen both eyes. There were no palpable preauricular lymph nodes. Based on the history and findings, a diagnosis of malignant melanoma LUL was made. Wide excision of the lesion with lid reconstruction was planned. 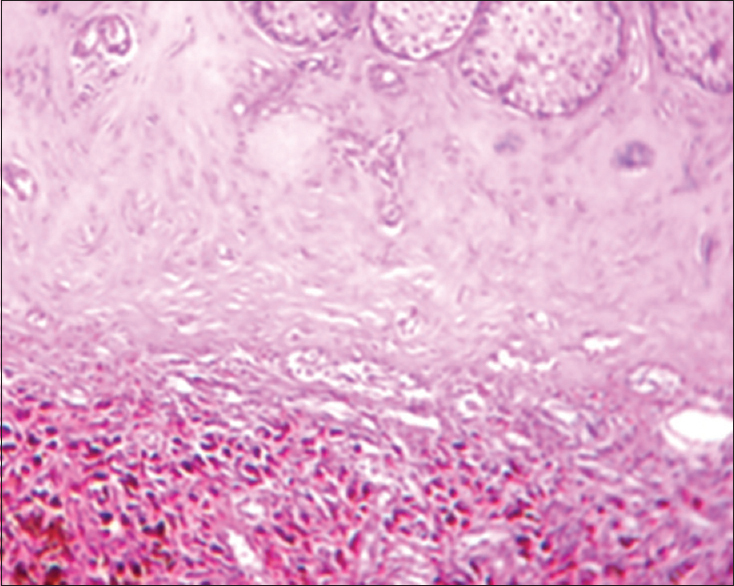 Full-thickness excision of malignant melanoma LUL with a margin of normal tissue was done. After measuring the amount of tissue required, harvesting of nasal cartilage along with mucous membrane was done [Figure 2]a and [Figure 2]b. Further, suturing of nasal cartilage and mucous membrane onto excised area was done in layers [Figure 3]Ia. The sutured nasal cartilage was covered by mobilization of the remaining skin below the eyebrow [Figure 3]Ib, and the residual defect was closed using skin graft from postauricular region [Figure 3]Ic. Postoperatively, the patient was fine by appearance and function of the reconstructed upper lid [Figure 3]II. Histopathology showed sections composed of oval-to-spindle cells arranged in sheets and containing melanin [Figure 4]. The margins of the excised lesion were free. Immunohistochemistry found human melanoma black-45 positive. She was referred to the Oncology Department for metastasis workup. The patient was followed up for the next 3 months and did not have any difficulty regarding the left eye. There was no local recurrence. One year later, the patient was reported to have expired due to secondaries. Malignant tumors of the eyelid pose a serious threat because of their proximity to the globe, brain, and paranasal sinuses. Malignant eyelid tumors affect the lower eyelid in about 59% of patients, 22% in the inner canthus, 14% in the superior eyelid, and 5% in the external canthus. Studies indicate that basal cell carcinoma is the most frequent malignant eyelid tumor, followed by squamous cell carcinoma, sebaceous gland carcinoma, and malignant melanoma. Repair of the UL is more difficult because of the unique anatomic requirements of the upper eyelid. The eyelid must remain pliable, allow for retraction and protraction, and also have a mucous membrane on the posterior surface. A number of procedures are available to repair large to total upper eyelid defects. These surgical techniques include lower lid (LL) switch flaps and LL bridge flaps. However, these procedures have several disadvantages, such as the partial or total sacrifice of the LL and the need for secondary correction. When the defects are >75%, the choice of restoration of the anterior layer is a cheek flap, and the posterior layer is restored by a composite graft harvested from the nasal septal cartilage and inner lining. Full-thickness eyelid defects are conventionally reconstructed by either a Hughes flap or a Cutler-Beard bridge flap. In the Cutler-Beard procedure, a full-thickness flap of LL tissue is mobilized 5 mm beneath lid margin and advanced to cover the UL defect under the intact bridge of the LL. After 4–8 weeks, the flap is divided at the level of the UL margin. The switch flap is an alternative method but not very widely practiced. The technique involves switching a full-thickness flap on a pedicle to fill a defect from LL to upper or vice versa. The pedicle is divided in 3 weeks. The recipient lid is reconstructed by direct closure and the donor lid by direct closure with or without cantholysis or sliding flap, or it is left to heal by second intention. Cutaneous melanoma of the eyelid is relatively rare, accounting for fewer than 1% of all eyelid malignancies. Since eyelid melanomas are associated with a risk of distant organ metastasis, patients with eyelid and ocular surface malignancies need to be monitored with careful long-term follow-up. Unfortunately, the patient described in this case expired due to secondaries. This is a procedure which can be done in a single-stage compared to the earlier procedures which require two sittings. The harvesting of the nasal cartilage has to be done properly and the hair has to be trimmed as it can irritate the cornea. The only disadvantage is the absence of eyelashes. This case is presented also for the rarity and urgency in the management and follow-up. Authors gratefully acknowledge the valuable help of Dr. Ajith TA, Professor, Department of Biochemistry, Amala Institute of Medical Sciences, Thrissur, Kerala, India, during the preparation of the manuscript. Cook BE Jr., Bartley GB. Epidemiologic characteristics and clinical course of patients with malignant eyelid tumors in an incidence cohort in olmsted county, minnesota. Ophthalmology 1999;106:746-50. Yin VT, Merritt HA, Sniegowski M, Esmaeli B. Eyelid and ocular surface carcinoma: Diagnosis and management. Clin Dermatol 2015;33:159-69. Cook BE Jr., Bartley GB. Treatment options and future prospects for the management of eyelid malignancies: An evidence-based update. Ophthalmology 2001;108:2088-98. Loeffler M, Hornblass A. Characteristics and behavior of eyelid carcinoma (basal cell, squamous cell sebaceous gland, and malignant melanoma). Ophthalmic Surg 1990;21:513-8. Gu J, Zhai J, Chen J. The use of acellular human dermis composite graft for upper eyelid reconstruction in ocular injury. J Trauma Acute Care Surg 2012;72:288-92. Collin JR. Eyelid reconstruction and tumour management. In: A Manual of Systematic Eyelid Surgery. 3rd ed. Elsevier, UK; 2006. p. 115-45. Stafanous SN. The switch flap in eyelid reconstruction. Orbit 2007;26:255-62. Gunduz K, Esmaeli B. Diagnosis and management of malignant tumors of the eyelid, conjunctiva, and orbit. Expert Rev Ophthalmol 2008;3:63-75.